Artwork by Chris Oyster on Thursday night during the heavy rain. His hopes were realized over the next two nights! 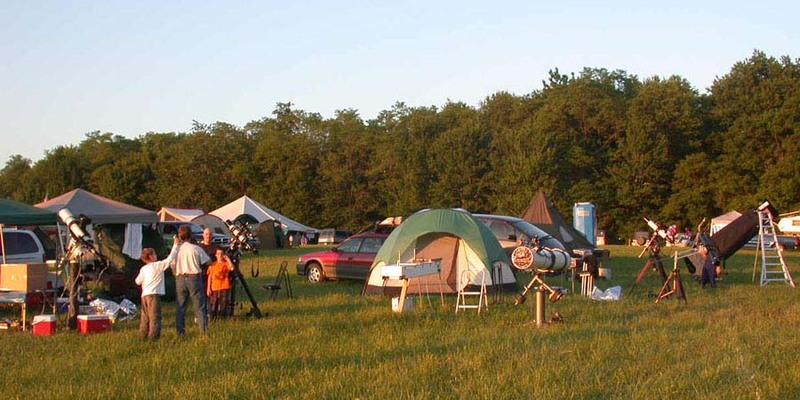 I have never seen a harder working starparty crew than the one at Laurel Highlands Star Party. 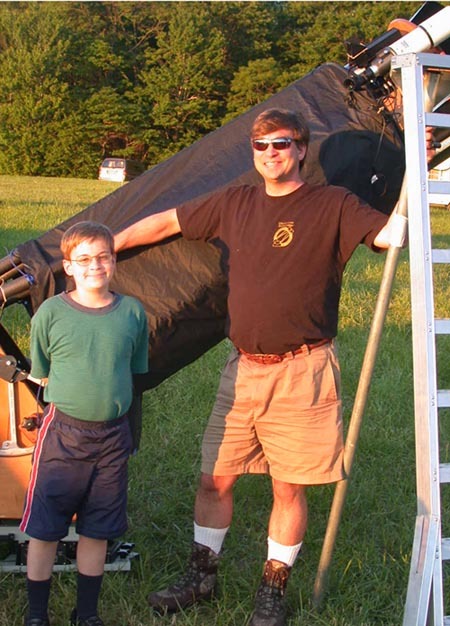 Terry Trees, Larry McHenry, Ed Moss, John Holtz, and many others have developed this event into a premier week-long starparty. They are not content with the current status. They are continually seeking out ideas and suggestions for improving the event. This year, there were many competing starparty events. I have not attended the New Jersey event, but I have attended the Mason Dixon event. If you want dark skies and a starparty, it seems to me that Laurel Highlands is your best bet for the spring in the east. Formal presentations began on Wednesday and concluded on Saturday. Observing began as early as Monday. 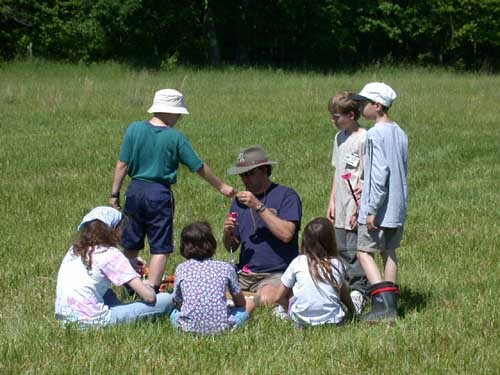 Many of these activities are children events. I don't believe any event in the east offers programming to that extent. Perhaps the Winter Star Party. Is it a perfect sky? No. There is a light dome to the northwest from Uniontown. It is summer, who cares about the northwest? The summer Milky Way was breathtaking. You can read my observation report below for more details. Granted, Spruce Knob has a better total sky, but if you are wanting to combine a great weekend of observing/photography at a DARK site with a group of amateurs who share your passion for astronomy, Laurel Highlands Star Cruise serves as the standard to beat in the east coast for the spring/summer season. Black Forest is the place to be in the east for the fall schedule of starparties. Observing/Astrophotography equipment in the camp: 20" Obsession, TV102, 10" Cave Astrola, AP 130EDT, TV101, 4" reflector, TV85, Fuji 7x50. WE WON, again: Our winnings weren't as big as last year, but our camp did well with respect to door prizes. Chris O won the Orion case, Dave T won the planisphere, and I won the set of Night Sky Observer's guide. I can't express how useful this book is to astrophotographers. Justin (left) and Rodger Blake with their 20" Obsession. Outstanding views were had with this instrument! Best Views: during my imaging sessions I get to sneak wonderful views from others. Thanks a bunch to all who shared wonderful views! Pine Hill is located about 10 minutes off of I-68 which runs just below the Mason-Dixon line. The elevation at the site is around 2,200 feet. It is a beautiful forested area with Morgantown the nearest city of consequence about 30 miles to the west. Limiting Magnitude- Sky background flux of 70: Now that I have begun imaging with CCD, I can utilize technology in quantifying our sky conditions at Laurel Highlands. I took background measurements on Saturday night. Friday night was a little more transparent, but turbulent conditions prohibited imaging with CCD. Here is a link to the mathematical calculations and theory behind the technique. A special thanks to Stan Moore for making the webpage available! The numbers according to my camera (ST10e) have a background flux of 70. That seems to compare very favorably with some of the darker imaging sites in the California mountain ranges. Light domes: There is one noticeable light dome to the north-northwest that is from the Uniontown area. It rises no more than 15 degrees above the horizon and was not significant in any way. 75% of the sky is excellent. The southern sky is gorgeous. The field: The observing field is quite large and has plenty of room for more participants. It provides excellent horizons. There is no electricity on the field, however. The bathhouses are located in the main camping area, which is about .3 miles away. It is a nice walk or a short drive. The bathhouses are comfortable and convenient. The field can accommodate large RV’s. The organizers sectioned off the entire field with observing spaces that were quite large. This really added structure to the field and provided defined areas for foot and vehicular traffic. The heavy rains on Thursday really created a mud-bog on Friday. The hot Sun and gentle wind dried the field much quicker than I ever would have expected. I feared that the ground moisture was going to lead to ground fog on Friday night. The sky could not have been clearer on Friday night. We were very relieved. Chris Oyster presents his 4" reflector to the group touring unique telescopes. This is a reflector of unknown make that has been refurbished and painted and gave some pretty nice views. Food was catered by a local deli shop. The food was prepared off-site and brought to the campground. Mealtimes were relatively fixed. Snacks were available until around 11:00 p.m. The food was very good. Not as convenient as having May's around at all hours of the night, but I certainly did not go "without" when it came to food. Very nice caterer and I am sure they learned a lot about planning food for a starparty. The door prizes just keep getting better. 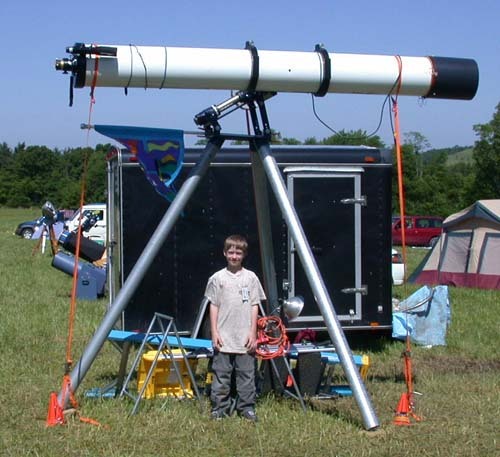 Two telescopes and a 16mm Nagler type 5 were the big ones I remember. I did win the prize I wanted most, the Night Sky Observers Guide. The Pittsburgh group continues to build this event. I believe the event attendance was a little under 300. Please see their website for future dates. I believe they have moved from the new Moon date on Memorial weekend next year to later in June. This works well for me-I get to go to New Mexico skies for Memorial Weekend next year! Chris Oyster under a brand new D&G 10" refractor. Cool, huh?